Manage multiple audio sources and sets of monitor speakers, track using illegally loud headphone amplifiers, and talk back to your drummer-all from your desktop.Your personal studio is well equipped with a great interface and a CD player with an S/PDIF digital output. Perhaps you also need to listen to audio from a third source, such as a tape deck, or you want to be able to audition two different stereo mixes from the interface. 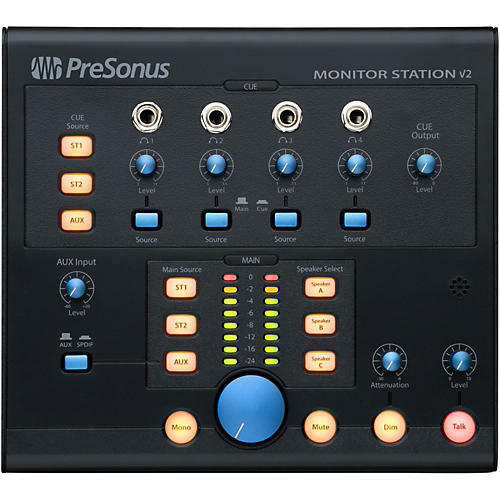 The Monitor Station V2 provides a convenient desktop control center where you can switch between these sources without compromising the sound quality. Switch between two pairs of balanced ¼" TRS and a third input channel that can be fed from an S/PDIF digital input (44.1, 48, 88.2, and 96 kHz), one pair of unbalanced RCA Aux inputs with gain control, and a 1/8" TRS unbalanced input that is summed with the RCA Aux inputs. A button switches between the analog Aux and digital S/PDIF inputs. The Monitor Station allows each of the stereo inputs (TRS1, TRS2, aux) to be routed to one of two audio paths: Main and Cue. You also can route two separate signals (Main and Cue) to each of the four headphone amplifiers, which we'll discuss shortly. No worries! With Monitor Station V2, you can switch between the three sets of monitors instantly! Not only that, you can set each set of speakers' level individually so that when you switch between speakers, your monitoring level stay the same. You have nothing against drummers (that you'll admit to); you simply can't fit drums in your main studio room. However, drums sound great in that big living room. And you get terrific natural reverb on the guitar when you throw that six-string slinger and his rig in the bathroom. Your treated walk-in closet makes a dandy isolation booth for singers. But they each need a headphone feed, and you need to give them verbal cues. And you don't want to buy even more gear to do it. You're covered with Monitor Station V2. It offers four ¼" TRS stereo headphone outputs driven by amplifiers so loud they ought to be illegal. Unless they're stone deaf, your musicians will hear themselves! Each headphone out has a Main/Cue source selector, and individual output-level control. That's the equivalent of a built-in HP4 headphone system! There's more to managing a monitoring system than I/O, level controls, and talkback; Monitor Station V2 delivers all of the features you need.